When the last joint has been smoked, the vaporizer has run out of oil, and the Munchies Monster is demanding to be fed, where do marijuana users go to feast? According to a new study of legal cannabis consumers, McDonald’s is the most popular destination for folks with the munchies. Green Market Report and Consumer Research Around Cannabis conducted a survey in 25 U.S. markets and found that 43% of people who purchased cannabis from a legally authorized dispensary said they ate McDonald’s food in the previous four weeks. Coming in at a distant second was Taco Bell, with just 18% of those marijuana users, followed by Wendy’s (17.8%), Burger King (17.6%), Subway (8.7%), and KFC (5.5%). However, it’s worth noting that McDonald’s spot at the top of the list has a lot to do with the fact that it has more locations than the other chains: The Golden Arches has about 14,000 restaurants in the U.S., while Taco Bell has about 5,600 domestic locations. Though this size argument doesn’t hold true for Subway. The sandwich shop chain has more locations than any other fast food operation. 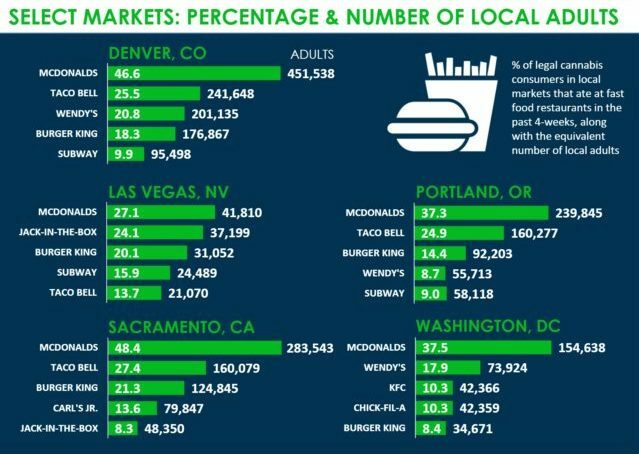 At around 27,000 stores, Subway has nearly double the number of U.S. locations as McDonald’s, but couldn’t even crack the top four in most markets in this survey.